The paint is not a design trend, but has been used for over 350 years as a coating material especially for wood in the outdoor area. Its origin is the so-called Falun red (faluröd) in the mining town of Falun. The ore mined there has a strong reddish colour as the copper contained in the ore is mineralised over time. Other components include limonite, silicic acid and zinc. Sludge came up during the ore production which contained remnants of these substances and from which finally the wood paint was produced. The binder used was cornstarch and linseed oil, which were boiled together with iron vitriol and the mineral pigment. 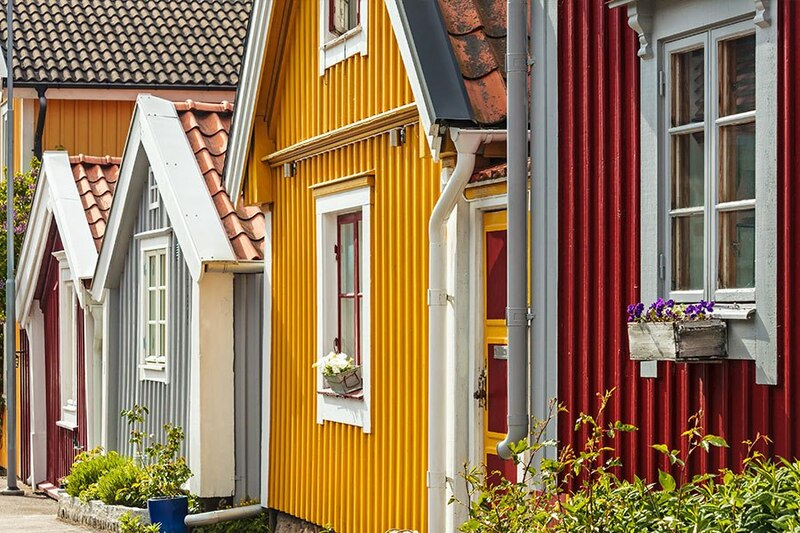 Even a harsh climate with extremely changeable weather conditions could not harm the houses in Swedish paint. The wood-protecting effect of Falun red is based on copper- and iron-containing pigments, which lay on the wood surface like a protective layer and keep out environmental influences. The paint film is not completely dense and lets the wood breathe. The red mud paint lights up earth-red in dry weather, but in damp weather it is a few nuances darker. What always remains the same however is the homely atmosphere that a wooden house in Swedish red creates. Not least due to the limited field of application (only untreated and pine, spruce, fir wood) and the damaging copper-containing components, traditional mud paints are hardly ever used in residential construction today. Instead, the abrasion resistant paints acrylate-, alkyd- or water-based paints (e.g., ADLER Pullex Color) are counted on. These are not only extremely weather-resistant but are also characterised by long-lasting wood protection. Alongside the classic Falun red, there are other classic Swedish colour shades such as Swedish grey and Swedish blue. If you like it green, go for a Swedish green. Or opt for a lighter coating, for example in ochre or creamy white. In a typical Swedish house, the windows have white soffits, so they stand out clearly from the mostly red façade. Also, the characteristic entrance porch, usually bordered by a small railing, is kept in white. The proven Pullex Color product pallet is available for all Swedish-style coatings on wood. The opaque wood coating is especially suitable for wooden structural elements outside - for wooden houses, canopies, wood panelling, balconies, fences, shutters and gates. It offers the best binder combination for excellent outdoor durability and diffusivity, with no copper-containing components. The design of garden houses in the style of red and white houses in Sweden is also very much in vogue here.